The right accessory is the finishing touch to a room. 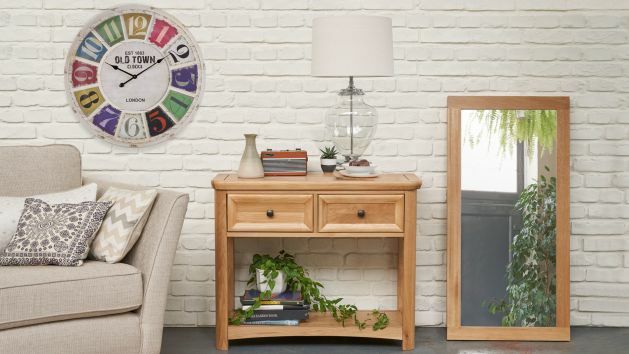 Browse our large range of clocks, lamps and variety of mirrors framed in oak, mango, and painted hardwood. The right home accessory in the right spot can pull a room together. Here you’ll find stunning homeware, from decorative clocks and lamps, to a large range of wall and dressing table mirrors. Make a statement with a metre-wide skeleton clock, or choose a clock with coloured blocks and numbers, or even romantic flowers or maps on the clock face. Browse our table and floor lamps, where you’ll find a variety of styles, ranging from sophisticated copper coloured bases and glass urn-shaped table lamps through to modern metal standard lamp and spiky tripod floor lamp. Glass means class, and most of our cabinet ranges have a matching wall mirror or dressing table mirror, carrying themes that feature in the cabinet through to the frames or bases. A large mirror can open up a room, reflecting light in from a window. Light up a corner by standing a tall mirror from the floor, or hang a mirror along the length of a sofa or sideboard to play with how light falls in a room. Match a table top mirror to your dressing table, and set yourself up for the day – or an evening out. And remember – you can choose one of these home accessories and receive it free when you spend over £1,500 in one order.